For the second year in a row, the Montreal Canadiens are playoff bound. The team clinched Tuesday night despite losing 3-1 to the Tampa Bay Lightning because the New Jersey Devils and Washington Capitals both lost. Montreal is currently third in the Atlantic Division and are fighting with Tampa for the second seed. The loss to Tampa broke a five game winning streak for Montreal and came against the team Montreal will likely face in the first round. Under the new playoff format, second and third place teams in each division will face each other in the first round. “We’re disappointed with our game today, but big picture, we’ve got to be happy with that,” goaltender Carey Price said, echoing his teammates. NHL.com posted an article giving five reasons why Montreal are in the playoffs. Their biggest reason? 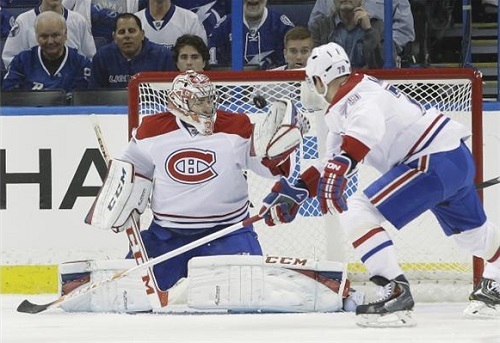 Price’s strong play all season, including this save on Tyler Johnson shorthanded to keep the score tied 1-1. They go on to say Montreal’s special teams, defencemen and a strong top six. Led by Max Pacioretty’s 35 goals and PK Subban’s 54 points, the team was given a big boost with the acquisition of Thomas Vanek at the trade deadline. With five games to go, getting all the goals they can get will make Price’s job easier and will help Montreal clinch second in the Atlantic. The only question is, can they beat Tampa Bay? Time will tell when the NHL playoffs kick off April 16.